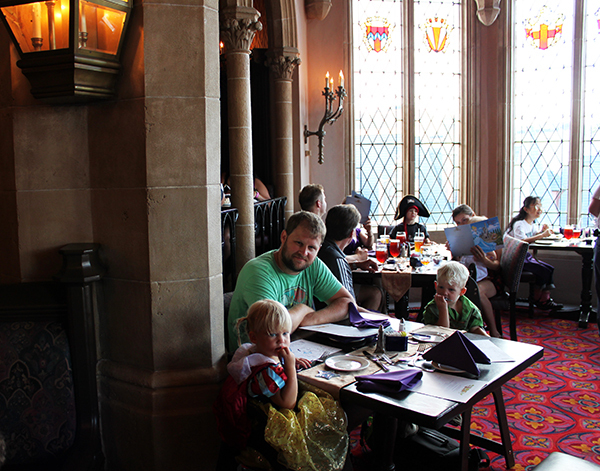 Cinderella’s Royal Table Restaurant is actually inside Cinderella’s castle! Instead of walking underneath the castle and out the other side, you are beckoned into the inner sanctum where the servants pull out the red carpet, literally. 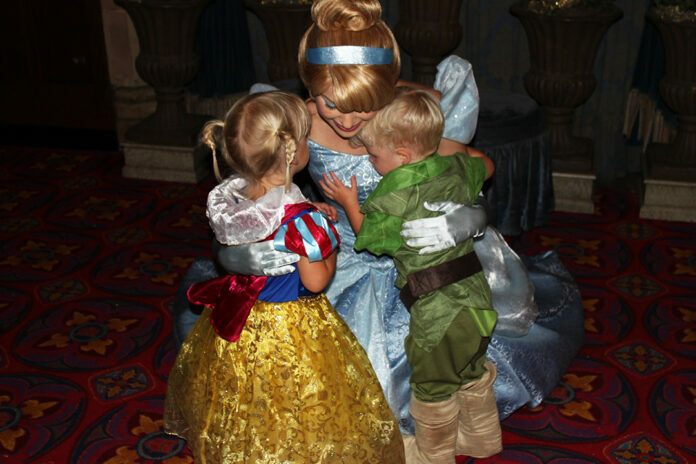 You’re immediately whisked into the Royal Throne room where you are presented before Cinderella. Of course you get to meet and talk with her, and take your picture with her royal highness. Afterwards the royal guards will announce your name and invite you to walk up the grand staircase to the dining room. Cinderella’s Royal Table offers incredible views of the park with gorgeous stained glass windows and tall expansive ceilings that reach towards the stars. That’s pretty much where we stopped being impressed. The dining room is quite small. In order to accommodate the vast throngs of people that want to witness Cinderella’s Royal Table and Cinderella’s new home after her alluring rags to riches story, by reservation only, the tables are scrunched so close together you can barely move without bumping into someone else. 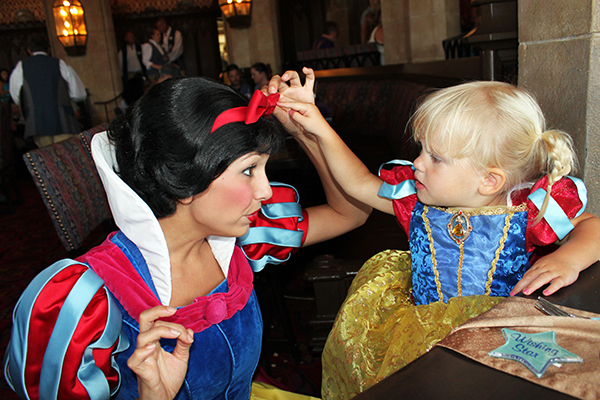 Snow White, Jasmine, Belle and other princesses join Cinderella in the castle dining room to visit, hug, take photos, and hear about your vacation throughout dinner, but only once. Don’t expect them to say hello, look your direction, or stop by after you’ve already visited with them. 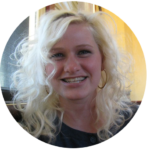 After their name is announced, they enter from a raised platform near the entrance to the kitchen, as if they double as wait or kitchen staff, and then swiftly move throughout the restaurant as everyone excitedly bumps into their neighboring tables as they scoot, stand up, and scamper for attention. It’s a wonder everyone doesn’t fall like dominoes in the process. The food is expensive! It’s 2 credits on the dining plan, or triple dollar signs. It doesn’t even come close to being worth it. Once seated, your server will offer the boys a royal sword, and the girls a royal star scepter. All patrons receive a plastic wishing star. These items will aid you in making a wish during a forgettable ceremony in the middle of dinner. The toys will be broken long before the clock strikes midnight. My chicken was so dry, paper would have been easier to swallow. Our server acted annoyed with everyone. The princesses were rushed so they could get back to overcooking our food, and don’t you dare ask for a window seat unless you want to risk watching the person you ask explode like a volcano. I think the same people that designed this Disney dining experience, planned Frozen Night on the Disney Magic Cruise. ► For Kids: They probably won’t notice the cramped tables, the annoyed staff or even the bad food. They will, however, notice that the princesses leave their table mid sentence, someone constantly bumping into them and sometimes knocking them over, and when their toys break before they finish their meal. ► Nap-Time Version: Between trying to choke down truly disgusting food, feeling claustrophobic, and just simply wanting to leave, you wish you never came at all to Cinderella’s Royal Table. 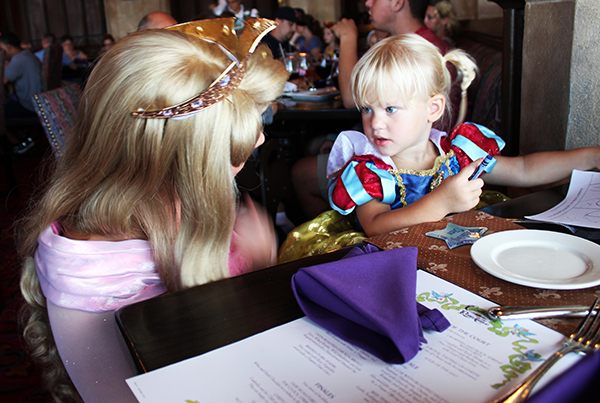 I don’t complain about Disney often, but Akershus (coming soon) or 1900 Park Fare are both much better choices for Princess character dining, while Be Our Guest is a resplendent castle dining experience. 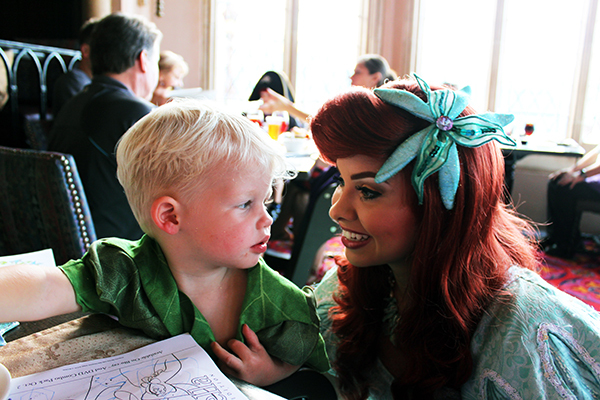 Check them out, or any of our other Disney Dining experiences at Walt Disney World, and let us know what you think!